I acquired my first amplifier about two years ago. It was a well worn SB1000. It needed a few repairs as there were missing parts and loose components inside. 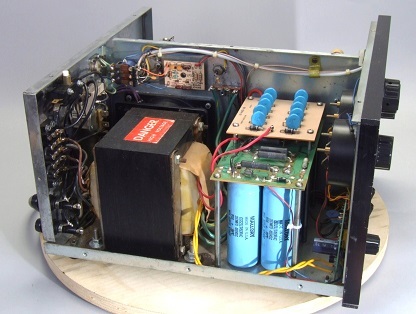 I was surprised to learn that this amplifier was identical to the Ameritron AL80B and that parts were still available from Harbach and from Ameritron/MFJ. After disassembly and some clean up, I took inventory of what I would need to buy in order to bring the SB1000 back to life. It needed a bandswitch wafer,( AR-136-2) a new plate choke, a high voltage doorknob capacitor(170pF N750), and a small RFC choke. All of these were available from Ameritron. The SB1000 is a simple and reliable single 3-500Z grounded grid 160 through 10 meter amplifier. On one side of the chassis is the solid state DC power supply and metering circuitry. Also the antenna relay and AC control circuitry is on the rear panel in the power supply section. This leaves the other half of the chassis for the amplifier tube and its components. Ameritron had provided me with an improved plate choke. You can see it in the picture to the left. The winding is segmented and not continuos like the original. 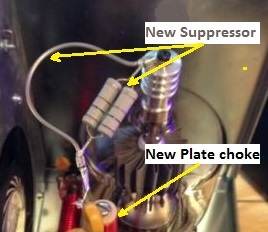 Once completely reassembled I removed the 3-500Z and the plate cap and suppresser coil. It was time to check the High Voltage section of the amplifier. Of course I had already checked all of the rectifier diodes and checked for any direct shorts from the rectifier boards output to ground. I did a shorts test on the 7.5 volt Zener bias diode and found it to be OK. I double checked the AC power wiring to make sure the amplifier was set up for 115 volts. The amplifier was a go for power. I set the front panel meter to read Plate Voltage and inserted some new fuses. I defeated the AC power interlock with a wooden clothespin and stood way back. The power switch was ON and the power cord was run to my trusty Variac. The Variac was used to slowly turned up the AC. There was no smoke and the plate voltage meter swung to almost 3200 volts as the Variac reached 110 volts. All seemed to be OK on the power supply side. A few more checks and I would be ready to put the RF section to work. The ALC circuitry and the Power Output detectors were both simple diode circuits. I check all four diodes on the ALC board to make sure they were both good using my DMM on "diode" test. I had previously rigged a push button switch to a long set of twisted wires with an RCA plug attached. I would used this to remotely key the amplifier. Now I needed to check the bias Zener one more time but for this test I needed to installed the 3-500Z and its plate cap. I turned the Amplifier OFF and allowed it to sit for a while as I watched the Plate Voltage meter return to zero. I wouldn't need the Variac for the next tests so I disconnected it and plugged directly into the AC outlet. Next using my DMM I attached the leads to measure the voltage between the Zeners cathode and chassis ground. I set the amplifiers meter to plate current. Once the tube and its plate cap and suppesser were back into the circuit, I fired up the amplifier. I gave the tube a minute to warm up. What a wonder sight , that glow was what I had been waiting for. I watched the Plate Current meter to make sure the tube was in cut off, yes no plate current. I placed the Operate switch to ON, the DMM read 27 volts and I was ready to key the amp using my push botton. The relay snaped, the red LED light was on, the DMM was now reading 7.8 volts and the plate current jumped to 70 ma. It seemed all was OK. It was now time for RF testing. For this I needed to install the case and remove my clothespin interlock defeater. If you own a SB1000 you probably know that they have a band switch arcing problem. The band switch on this amplifier was badly burned in the 80/160 meter positions and the 160 meter padding doorknob capacitor was missing when I got the unit. I suspect it was fried and had been discarded by a previous owner. There are many opinions as to what causes this arcing problem, one posible reason is VHF oscillication and an another is corona discharge. Both of these have recommended fixes. Since the Ameritron AL80A is an almost identical amplifier we can assume it has the same problem, but it doesn't seem to be as prevelent in the Ameritron. If you Google this topic you will find that some experts blame the arcing on the lack of a corona spacer or washer on the Heathkit band switch. 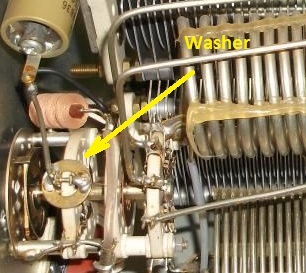 The washer is a #8 brass washer that gets soldered along with the doorknob capacitor wire to the contact on the band switch wafer which switches in this capacitor only on 160m. Basically you unsolder the wire to that connection, slip the washer over the contact post and reconnect the wire and solder the connection with the washer included. Now some experts believe this is not a real fix and suggest removing the doorknob capacitor and subing in a high quality mica capacitor of equal value, which by the way is what Ameritron did. I however purchased a new doorknob capacitor so I just installed the washer. The other theory as to the cause of this arcing is parasitic oscillations at VHF frequencies. 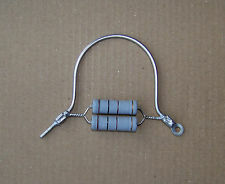 The recommended cure is to use a new design of suppressor with a single hair pin loop and two high wattage MOFresistors. These can be purchased on ebay or you can build them. I purchased one on ebay for about 12 dollars shipped. See pictures below. Having worked on many RF amplifiers the one thing I always do is inspect all of my solder joints for sharp edges or points. These can contribute to arcing. Wire spacing is also important. So always check the connections on the bandswitch and on the coils to make sure you haven't provided a corona path. After making these minor improvements and inspecting the quality of assembly, RF testing could finally begin. Here are the results of my testing. The above table was generated using a Heathkit SB102 as the exciter driving the SB1000 via a 4 foot 50 ohm coax. The amplifier's output was connected to a Bird Dummy Load. Both input and output power and VSWR were measured using two Signal Crafter model 30 watt meters. No band switch arcing was noticed during this testing. 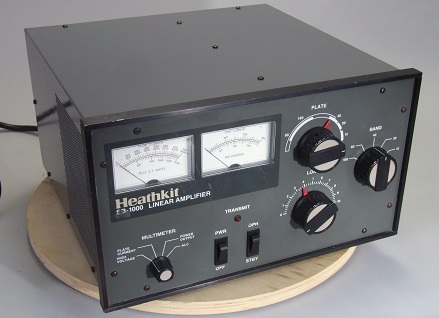 The 160 meter band was not tested as the SB102 exciter is an 80 through 10 only transceiver. The 3-500Z is not new but still seems to be usable.